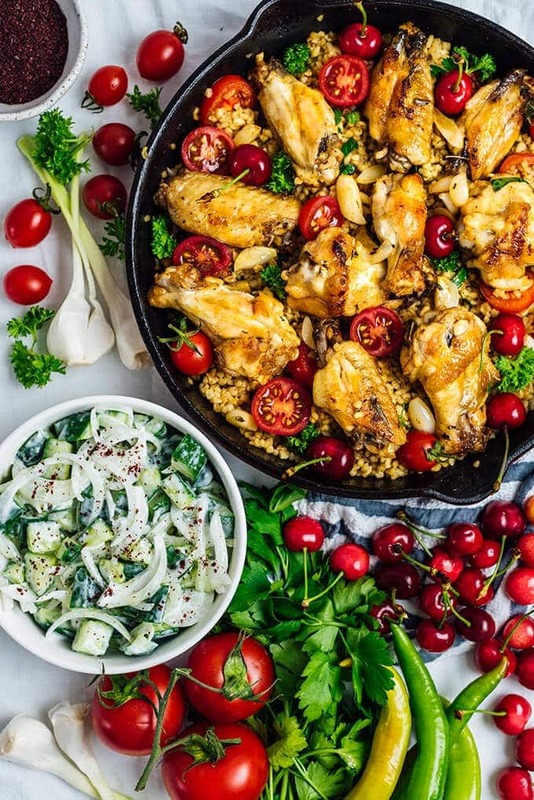 One Pan Garlic Lemon Chicken Wings with Bulgur is a satisfying Mediterranean-inspired dish with minimum washing up. It makes a perfect weeknight dinner. The happy marriage of chicken and bulgur is a common way of cooking chicken in the Middle East cuisine. My family always welcomes it no matter how I combine these two. 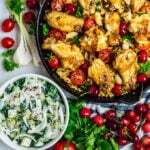 Why I love this Garlic Lemon Chicken with Bulgur recipe is that it’s super easy and everything is cooked in one pan. Who doesn’t love it when there is less mess to clean up? 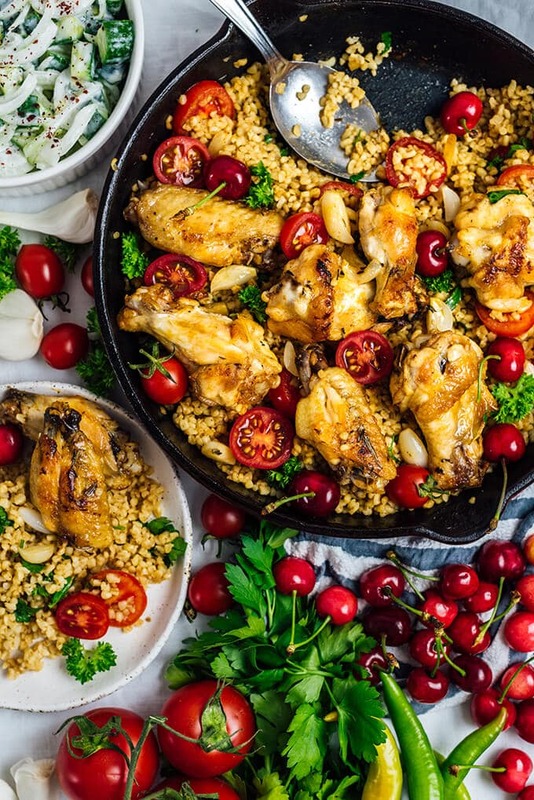 This garlic lemon chicken wings with bulgur is not only one of the easiest weeknight dinners I’ve made, but it’s also so flavorful and filling. Everyone (including kids) eats it so heartily whenever I cook it that I feel like a professional chef. It’s the biggest gift for me when there isn’t anything left in the pan at the end of dinner. I can proudly say that this is one of those recipes my family would never get bored of. I learnt the method to cook chicken wings from mom. I love it because it’s easy and they taste like fried wings with little oil. It never disappoints me, so I mostly cook chicken wings in her way. On the other hand, I love to add my own twist on her basic recipe for chicken wings. That’s how I created this garlic lemon chicken wings with bulgur recipe. Mom has been here with us for a few days and luckily she had a chance to witness how her own recipe was developed when we made this together for dinner. Can you imagine how I felt proud of myself when she LOVED it? This is a mom and kid approved recipe, you have to give it a try! It’s important to steam the chicken wings first. To do this, heat the pan, place the wings and pour a little water over them. Let them cook covered over medium low heat. You will see how the wings first relase their water and then absorb it. This helps the chicken wings to get tender and juicy. Don’t overload the pan with the wings, otherwise you can’t give them a frying effect. You can use two pans if you want to double the recipe. When there is little water left in the pan, drizzle olive oil over the wings, sprinkle the spices you like, toss in garlic cloves and squeeze half lemon. Bring the heat to the lowest and cook them covered shaking the pan and flipping over the wings occasionally so that both sides get wonderfully golden. It could be better if I used garlic, lemon and olive oil to marinade the chicken wings and refrigerate it beforehand, but we are after easy and quick recipes during weekdays, right? Believe it or not, these garlic lemon chicken wings are finger lickin’ good already. If you have time though, you can try marinading the wings first. I’d love to hear how it turns out. Please share it in the comments section below. I only use the juice of the lemon, but you can slice the lemon and add them in the pan. You can add little water when you feel that they will get too sticky. As I love seasonal produces, how I serve this meal depends on the season. To give it a little refreshing touch, I always garnish it with some fresh veggies or fruit that we have on hand. I use cherries and cherry tomatoes this time to feel the summer, but I’d use spinach or cauliflower if we were in winter. What else do you think we can use to garnish it depending on the season? I’d be more than happy if you share your ideas in the comments section! 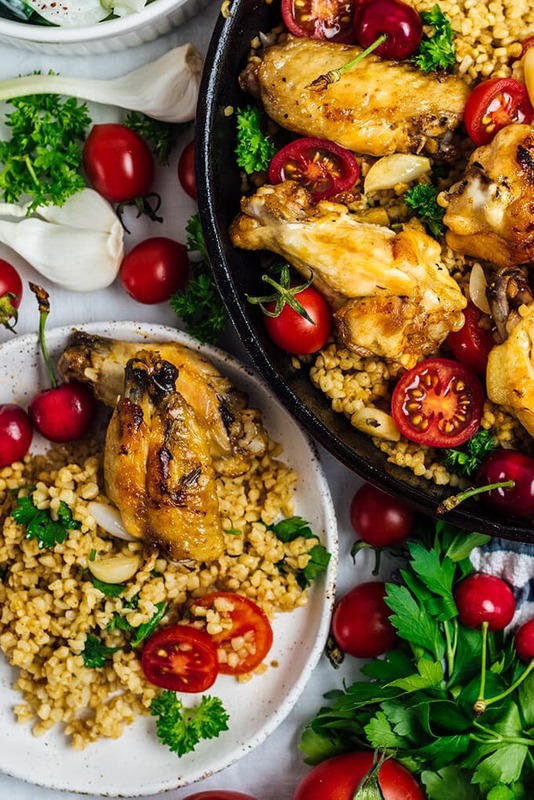 Garlic lemon chicken wings with bulgur is not only one of the easiest weeknight dinners I’ve made, but it’s also so flavorful and filling. Plus, everything is cooked in one pan. Heat a non-stick pan. Place chicken wings and pour water over them. Cook it covered over medium low heat until there is little water left. Bring to the lowest heat. Drizzle over the olive oil, add in the spices, garlic cloves and lemon juice. Keep cooking them covered flipping them over occasionally until both sides are golden. Transfer the chicken wings on a plate. Add 2 tablespoons olive oil in the pan and saute diced onion. Add in the bulgur and salt and cook it over medium low heat for about 5 minutes stirring occasionally. Pour the hot water and cook it covered over the lowest heat until it absorbs all the water. Remove it from the heat. Add in the chopped parsley and stir gently. Place the chicken wings on bulgur, put the lid back on the pan so that they are heated. Top with halved cherry tomatoes, cherries and fresh parsley leaves right before serving. Thanks for asking this! I just forgot to post that recipe on the blog although I wrote I would share it soon. I’m putting it in my recipe-to-post list now. Hopefully will shoot a photo of it and share it asap. In the meantime, I can roughly give you the recipe here. It’s super simple indeed. Combine diced cucumbers and sliced onion with Greek yogurt. Season with salt and sumac. Drizzle a little olive oil over it and serve. It goes perfectly with any meat or chicken dish even as a dip with snacks. One of my favorite combos is chicken with lemon juice! This recipe looks delicious, can’t wait to try it! hi how does this compare to the baked ones on your blog with baking powder,,? also do you think steaming the wings over a steam basket to render fat out would be better than boiling than to proceed with frying as in your recipe? Hi Mariam, I think these ones are more juicy. Never tried to cook chicken in a steam basket before, but I guess it would be fine.Hope this helps. Please share the result when you try. A beautiful dish, I would love to try it. We don’t eat bulgur often enough although I always have some in the house. This would be a great way of eating it. Thank you Adina! This recipe is always welcomed by my family. Hope you have a chance to try it and your family loves it as much as we do. I like the idea of steaming the wings like you said but if I did marinate them would it be before steaming them or after steaming and then go on with the rest of the recipe. It sounds delicious! I would marinade it before steaming.